Most Christmas albums comprise upbeat melodies about Santa Claus comin’ to town or an outcast reindeer saving the day with his nose. But that isn’t what David Bazan intended on his own holiday album, Dark Sacred Night, which is out now on Suicide Squeeze Records. Instead, the Seattle-born singer-songwriter who once sang under the moniker Pedro the Lion, would rather point out Christmas’ less-pleasant realities (family feuds, commercialization, the inherent gap between what some Christians preach and practice, etc.). He does this not because he wants to bum you out, but because he would rather you acknowledge all sides of the experience. Bazan’s Christmas contribution has actually been in the works for years. In 2002, Suicide Squeeze founder David Dickenson asked Bazan if he’d like to record a 7” of Christmas carols. Bazan agreed, and recorded a somber rendition of “I Heard The Bells On Christmas Day” and “Oh Come, Oh Come Emmanuel,” both of which he released as Pedro The Lion. Even after he began performing under his own name, Bazan continued to record and release holiday covers on an annual basis. For Dark Sacred Night, Bazan selected 10 of those 14 tracks. Paste: The songs on Dark Sacred Night were recorded over a number of years. What sparked the idea to compile them into one album—and this year in particular? 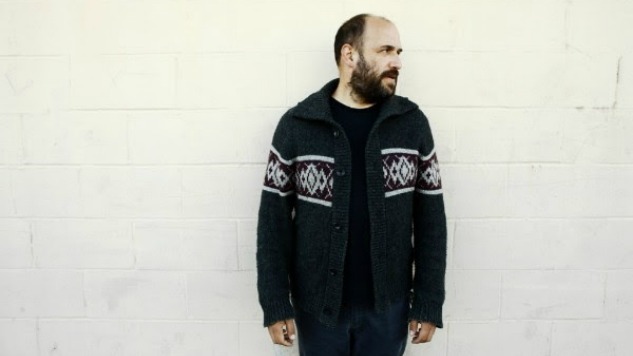 David Bazan: I don’t know. Whenever David [Dickenson, of Suicide Squeeze Records] proposed that I do a 7”, he said that maybe it’s the start of a series, that we keep limited in the single form but release in completion down the road. I think it was built into the idea. It was just a matter of when I was gonna do it. It turned out to be this year because it was the first year that I was able to get all of my ducks in a row in time, honestly. The deadline just creeps up so fast—it’s hard to think about Christmas in May. Or April. Y’know, Jesus has just been killed and he just rose again, and when you gotta think about Christmas, it doesn’t feel quite right. Sorry, I’m joking. But that’s also maybe true. Paste: Well, didn’t they used to celebrate Christmas in March? Bazan: I bet that’s right, yeah. Before they tried to take over the Pagan holiday or whatever? So I guess it’s back to the original spirit of putting out Christmas records, because you’re celebrating it in March and April. Paste: What does the album title, Dark Sacred Night, mean to you? Bazan: It’s a lyric from the song “What a Wonderful World.” It’s not necessarily a Christmas song. It feels like a winter song. It just reminds me of Christmas and winter, but also there’s a really brilliant sort of—it’s not exactly satire, but it’s a comment on the state of race relations in the United States. In that song, “What a Wonderful World,” there’s a subtext there that’s really profound. And so I guess I was also happy to bring that along into the record title, too. There’s a lot of that on the record—the gap between the virtue and the values of Christmas that Christians ostensibly hold up in the practice of justice in the world. It occurred to me to call [the record] that based on my love of that other song—which is not on the record. But it just seemed like it fit. There’s something peaceful and sweet about it, but there’s a barb in it, too. Bazan: Yeah, I wish it didn’t. But it does. All of my lyrics are coming back to me this year, and it’s not that fun [Laughs]. Paste: In the press materials for Dark Sacred Night, you describe Christmas music as “uncomfortable.” Why did you choose that word to describe a holiday album? Bazan: For me, the source of discomfort often rose from the over-commercialization of Christmas. And especially if you have some sort of idealistic connection with the holidays, via religion or whatever, that was always a tough tension. There’s a hundred ways for people to not connect and to get aggravated. There’s just a lot of pressure: Traffic gets worse; it’s this national deadline. In so many ways, it’s just sort of set up to add stress, and it rarely really pays any dividends in terms of nourishment and connection with a lot of people. Some people have come to not expect any kind of goodness from that time of the year anymore. In a lot of quiet desperate ways, it’s a source of shame and just weird, bad feelings. There isn’t any room to talk about [that] either—it’s a massive pressure cooker. If you say something about how you’re feeling that’s not super positive, then suddenly you’re Ebenezer Scrooge. Paste: I think the expectation of what a holiday should be tends to bleed into other holidays, too. New Year’s Eve, for instance. Bazan: And Valentine’s Day. Every holiday is a test in your relationship of how closely you’re paying attention to your partner because you had this one transformative Christmas when you were seven. And now it’s like, every Christmas you’re trying to find this idealized version of it still. There’s just all of this unspoken disconnect… There really is a ball of endless yarn to unspool, I feel like, and largely I think because it’s just not covered well in any kind of media. I have a strange relationship with Christmas. I guess I’m Charlie Brown with the raincloud over my head. Some of the sweetest memories from Christmas I had were: We’d go around to these shut-ins, these elderly people who never leave their house, and we’d sing Christmas carols. It’d be this very mixed cocktail of sweetness and nourishing feelings back the forth with the joy on their faces, but even knowing that they’re not going to have another visitor for another 30 days. If you tune into people, you tune into pain at certain points in people’s lives and certain points during the holidays. When I was a kid I noticed people for whom it was no fun. Paste: So how did you reconcile your feelings around Christmas and come to make a proper Christmas album? Bazan: It was kind of a challenge, but I thought, “I bet I’ll be able to figure it out, how best to express myself through this musical tradition.” And I think I slowly meandered my way so 14 years after I started to put 10 songs together and say, OK, this kind of holds true for a minute. Paste: Perhaps just even the act of singing can introduce a new levity to how you’d normally feel about Christmas. Bazan: Yeah, absolutely. It’s an effort to sort of break out of whatever little box I was and am continually in about the holidays. To kind of take that risk, so like you’re saying, to sing those songs is to take that risk of seeming dumb, or “What’s that guy even doing? Why’s he so sad?” Or whatever people think. So I think it’s true—to make connections with people, you have to take a risk in expressing yourself. But it’s a risk that I think uniquely honors how I view Christmas.